I Love You More Than Carrots: Mac Allen :: Happy Nine. This last month has been an absolute whirlwind for you, Maclane! To sum it up you are doing more, saying more, moving more and eating more! I guess the theme of month 9 would be "more" if there ever was one! I feel like both you and your brother are at an age that I absolutely adore. At 31 months he is a compassionate, energetic, talkative little boy and at nine months you not only are on the move but you are "talking," laughing and showing us all your feisty personality. Not a day goes by that you both don't have your Daddy and I in absolute stitches. Maclane, you are growing by absolute leaps and bounds. You love to explore and are an ace at getting into anything and everything. You absolutely love to crawl up and down the step between our family room and kitchen and once you've climbed up into the kitchen you make a beeline for your favorite spot, the drawer beneath the oven. You are a crawling machine. 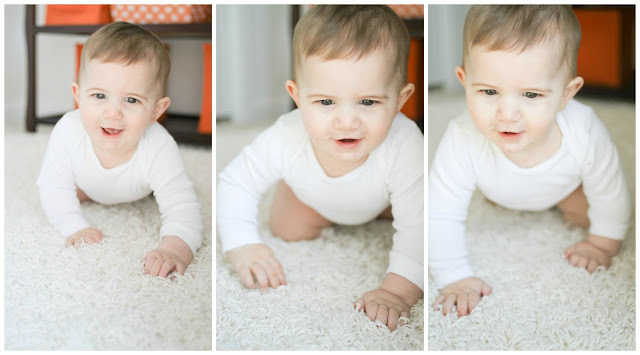 You quickly turned from army crawl to the full-on baby crawl earlier this month and never looked back. It was only within the last week or so that you started pulling yourself up to a standing position in your crib, the pack and play and on every single stationary object in our house- including but not limited to the couch, laundry baskets, the kitchen cabinets and you've even tried to stand up on Sheepie. You are fearless. Because of your newest trick we finally lowered your crib to the lowest setting where it will stay until it's time to move you to a big boy bed. We also moved you on up to the big boy convertible car seat. You whine for a minute whenever we go to sit you in it but the minute the car is moving, you're as happy as a lark. I feel like I blinked and we arrived at this spot in time. I don't know where the time goes. You babble and shriek and yell all day long. I can tell the minute your brother has taken something away from you because you begin to yell/whine at him. Immediately I have visions of you stealing his toys as you both grow, your sensitive older brother running to me to tattle. I can't help but laugh. You and your brother love each other so much. Your eyes light up the minute he enters the room and he loves nothing more than to run over to you and wrap you in a giant bear hug which to most onlookers appears to be more of a headlock. I have always loved watching you two grow together and I would be lying if I said this wasn't one of the things I look most forward to in the future. You will never have another friendship like the one you will find in your brother. Please don't ever lose each other. After months of offering you purees only to have you turn your nose at them and refuse to eat them, I threw in the towel and started giving you whatever it was that the rest of us were eating. Maclane, since we started this you have never once looked back. You will eat anything and everything placed in front of you so long as it isn't mush. I've been documenting your food adventures with #maceats on Instagram. This month you've nommed on mangoes, baked apples and peaches, blueberries, banana, sweet potato, carrots, green peas, green beans, broccoli, pasta, vanilla yogurt, coconut yogurt, pancakes, scrambled eggs and meatballs. Speaking of meatballs, your Daddy has taken to calling you his "Little Meatball" for weeks now and I just love it. There is not a single tooth in sight although your brother had four by this month! You also love Puffs and Mum-Mums as if they're going out of style. 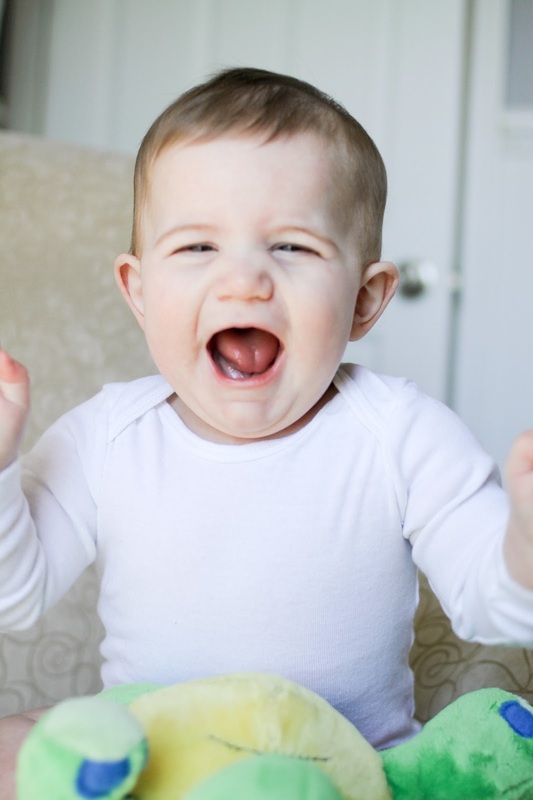 You've mastered two of my favorite baby milestones this month. Not only do you clap your hands when we say "yay!" but you started waving! I cannot get enough of that silly little baby wave. The kind where you turn your hand in towards your face, wave and watch it open and close. You are obsessed with bath time. For a while we had been bathing you every other day in the tub with your brother and on the nights that Carter would get a bath and you would not, you would protest and fuss and kick your legs like we were withholding food from you. You are a fish in that tub, Maclane. Splashing, trying to crawl, flipping over onto your belly. Aside from nursing, I would venture to say it's your favorite time of day. Just like your brother at this age, you've started taking only one 60 minute nap per day. I will admit that this scares me a little since your brother has never been fond of sleeping during the day. As it is, he gave up his naps for good around 28 months and I fear that we may be on the same path. You're still sleeping in our bed overnight but we've started putting you down in your crib until the first time you wake up to eat. I usually bring you into bed with us around 3am where you'll sleep perpendicular between your Daddy and me until around 7 or 7:30am. For nine months we have exclusively nursed. This deserves a whole post of it's own but I have grown to love this time with you so, so much. I'm so proud of us. I'm about to leave you for the very first time overnight, something I didn't do with your brother until he was 18 months old. I know you and your brother will be in very capable and loving hands with your Daddy, Gammy and Poppy but I can't help but hope and pray that I don't regret my decision for a minute. Know that I will miss you both terribly though while I am gone, mister! 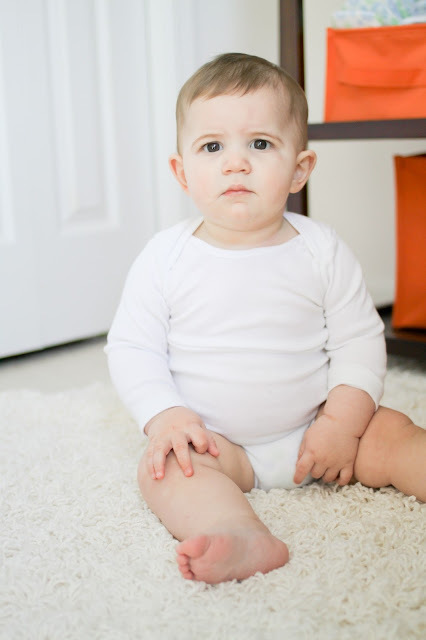 You are wearing size 4 diapers, size 5 diapers overnight and 12-18 month clothes, 18 month tops and 12-18 month bottoms. At your last pediatrician visit you were 26.5" long and weighed 22lbs. and that was over a month ago. Your eyes are brown as well as your hair which is growing at a rapid pace. 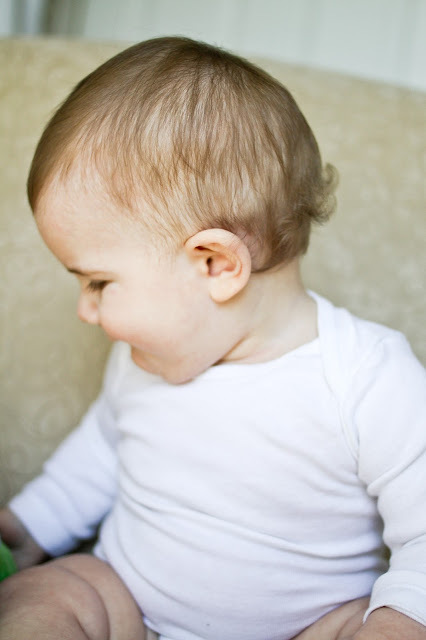 Most recently we noticed that the back ends will begin to curl after your bath and you sprout wings above your ears. I don't know what I'll do if you end up with curly hair like your brother! Perhaps I might just keel over from the cuteness of it all. You especially love your brother, your sheepdog, eating, stroller walks, waving, bubbles, crawling around the house after your brother, bananas, this giggling creepy turtle toy and pulling up to stand on whatever will bear your weight. There really isn't a whole lot you don't like, Mac! If I had to pick one thing, it would be bottles. Okay and purees. But other than that you are such a delightful, mellow little man. Nicknames: Meatball, Mackie, Smackers, MacAttack, Mac-a-doodle. Your brother insists on calling you "Baby" and only "Baby." 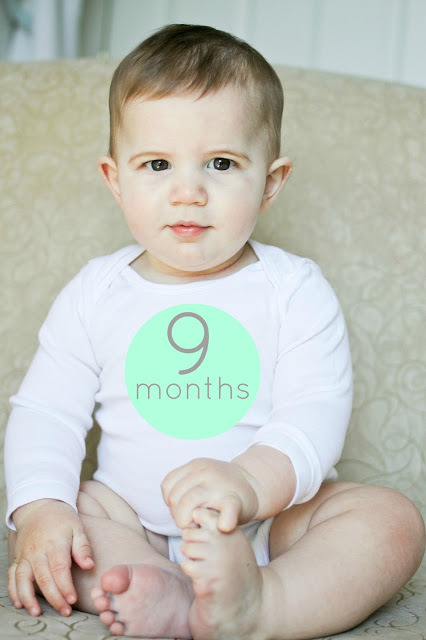 Happy Nine Months, Maclane Allen! We love your guts! Love, Mommy Daddy Carter and Sheepie. He is just so precious! I love the almost daily Instgram updates on him. I also love that you're such a great photographer. I'd love to do the same with my kids. Happy 9 months Mac! I love this post. SO many spots had me in tears. I just hear the love oozing from the paragraphs. LOVE THIS so much! He's your twin Ashley! FOR SURE! I love it! I love, love, love this! He has the best facial expression! I also have a just turned 9mo old who doesn't have any teeth. I never want her to lose that toothless smile. And, at 25lbs and 30.5in, she's my "Big Momma." Happy 9mo Mac! Ahhh...he's so cute. Nine months is such a fun age. Y'all with cute babies are giving me baby fever and I don't need it!! I could eat him with a spoon! What a little love bug! He's so lucky to have a loving big brother. It's too cute that C only wants to call him "baby". This little guy has some seriously great nicknames! Happy 9 months!! Love him! My favorite nickname for him is Little Meatball - maybe because I just want to eat him up! It's amazing how much he looks like you, so different from Carter! I hope you have a blast at Blissdom and don't miss your two little sweeties too badly. My husband and I are both leaving our 10 month old and two year for four days next week. Are you doing anything special to prepare them for you being gone? I hear children are sometimes mad at you when you get back. Happy 9 months to your little cutie! I love this type of post, I wish I had done something like this for my boys!! Seriously. Could he be any cuter!! Stop it. I didn't think he could get any cuter and then I are those little curls! Precious! !